PMO spokesperson calls Tory criticisms "absurd." Conservatives are claiming Prime Minister Justin Trudeau's high-profile Rolling Stone magazine interview complicates NAFTA talks, disrespects Canada's oil workers, and smacks of hypocrisy. A Prime Minister's Office spokesperson says those criticisms are "absurd." Lisa Raitt, the new deputy Tory leader, took perhaps the biggest swing at Trudeau's appearance on the cover of the magazine, which teased the story with a hypothetical: "Why can't he be our president?" The mostly fawning profile painted Trudeau as the antithesis to U.S. President Donald Trump and featured cringe-worthy lines, such as: "For Trudeau, listening is seducing." 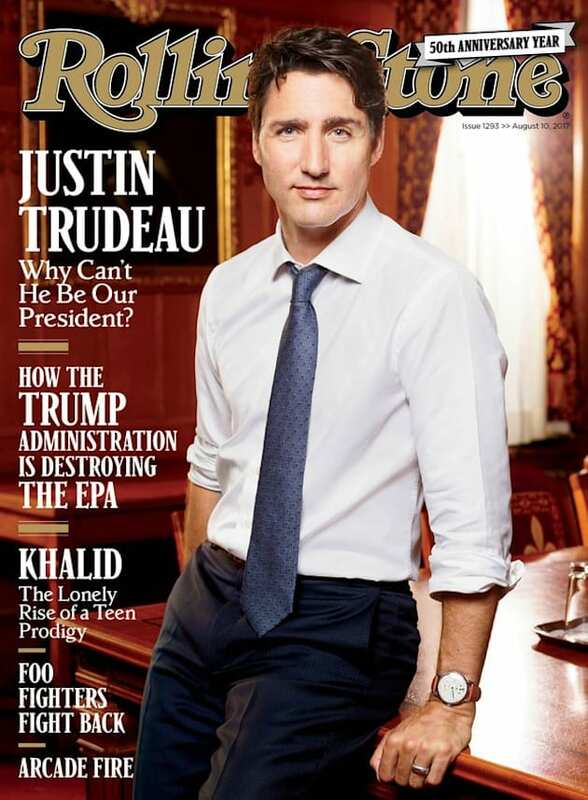 Prime Minister Justin Trudeau on the August 2017 cover of Rolling Stone. Raitt told The Globe and Mail Wednesday that the story was a "serious misstep" for Trudeau, who ought to have known he would be compared favourably to a "mercurial" U.S. president with a penchant for unpredictable moves. "I don't think it's helpful to the overall goal of our country, which is a free-trade deal," she told The Globe's Laura Stone. "Why does [Mr. Trudeau] need to do this right now, when it does put in danger the direction and the commencement of these negotiations?" The first round of trilateral negotiations on a new North American Free Trade Agreement kick off next month. Conservative Leader Andrew Scheer, meanwhile, took to Facebook to suggest the prime minister slighted Canadians who work in the oil and natural resources industry. Scheer focused on a passage in which Rolling Stone writer Stephen Rodrick — who compared the area around Alberta's oilsands to a "B-52 bombing range" — pressed Trudeau to square his support for both energy projects and the Paris climate accord. 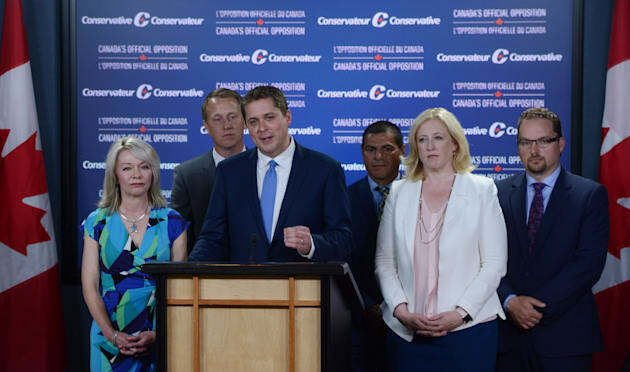 Conservative Leader Andrew Scheer makes an announcement with MPs Candice Bergen, Chris Warkentin, Alain Rayes, Lisa Raitt, and Mark Strahl, at the National Press Theatre in Ottawa on July 20, 2017. Trudeau is quoted saying: "One of the things that we have to realize is we cannot get off gas, we cannot get off oil, fossil fuels tomorrow — it's going to take a few decades." Rodrick writes that Trudeau added: "Maybe we can shorten it, but there's going to have to be a transition time." Scheer's post left out the part of Trudeau's quote calling for a "transition time." "Justin Trudeau's Canada does not include the tens of thousands of Canadians, and their families, who depend on jobs in our natural resources and energy industries," Scheer wrote. "His comments to Rolling Stone Magazine are very worrying to Canadians back home." In January, Scheer and other Tories running for the party leadership hammered Trudeau for saying at a town hall that while Canada "can't shut down the oilsands tomorrow," they will need to be phased out in time. The PMO told HuffPost Canada at the time that Trudeau's remarks were not so different than those of former Tory prime minister Stephen Harper, who also recognized the need to transition away from fossil fuels. Harper joined with other G7 leaders in 2015 to commit to the full phase-out of fossil fuels by the year 2100. Conservative MP Michelle Rempel also pounced on Trudeau's Rolling Stones interview with a lengthy Facebook post Wednesday. Rempel recently appeared on Fox News to speak out against the Trudeau government's decision to settle the lawsuit by former Guantanamo Bay inmate Omar Khadr for a reported $10.5 million. Tory MP Peter Kent also penned a blistering column on the topic for The Wall Street Journal. Senior Liberals charged that Tories were actively undermining Canada-U.S. relations ahead of NAFTA negotiations by taking domestic arguments to American airwaves and outlets. Trudeau told reporters last week that he has long believed politics should stop at the water's edge. Rempel's post argued Trudeau has used "puff pieces" from international outlets such as Vogue magazine to argue "Canada's domestic politics and personal branding transcends international boundaries." She said it was hypocritical of Trudeau to appear in "the highly visible and highly American Rolling Stone magazine" after the "feigned outrage" from Liberals over opposition MPs discussing the Khadr deal on U.S. media. "It's telling that Trudeau's position has been to attempt to defame the motives of opposition members, as opposed to defending his decision to give Khadr the money," she says. "This is because to Justin Trudeau, image is everything." "That approach doesn't serve anyone but himself," Rempel wrote. Trudeau's spokesperson Cameron Ahmad told HuffPost Canada while "editorial decisions are made by editors," anyone who reads the article will see the prime minister was respectful of Trump. "The conversation that the reporter had with the prime minister about the president, specifically asking about his relationship with him and his feelings about him, the prime minister highlighted the constructive working relationship that they have," Ahmad said. He also suggested Tories were missing the point of the Liberals' criticism of the Tories' U.S. media blitz. "We were saying their intervention in U.S. media, in Fox News and on other platforms... were specifically focused on criticism of the Canadian government," he said. "It's not like it just came up and they were talking about something else. "They were specifically, explicitly there to talk about a disagreement they had with the Canadian government on a foreign platform."